listen)) abbreviated to USSR (Russian language: СССР, tr. SSSR) or shortened to the Soviet Union (Russian language: Сове́тский Сою́з, tr. Sovetskij Soyuz, IPA: [sɐ'vʲetskʲɪj sɐˈjʉs]), was a Marxist–Leninist state on the Eurasian continent that existed between 1922 and 1991. A union of multiple subnational Soviet republics, its government and economy were highly centralized. The Soviet Union was a single-party state, governed by the Communist Party with Moscow as its capital. The Soviet Union had its roots in 1917 when the Bolsheviks, headed by Vladimir Lenin, led the October Revolution which overthrew the provisional government that had replaced the Tsar. They established the Russian Socialist Federative Soviet Republic (renamed Russian Soviet Federative Socialist Republic in 1936), beginning a civil war between pro-revolution Reds and counter-revolution Whites. The Red Army entered several territories of the former Russian Empire and helped local Communists take power through soviets, which nominally acted on behalf of workers and peasants. In 1922, the Communists were victorious, forming the Soviet Union with the unification of the Russian, Transcaucasian, Ukrainian, and Byelorussian republics. Following Lenin's death in 1924, a troika and a brief power struggle, Joseph Stalin came to power in the mid-1920s. 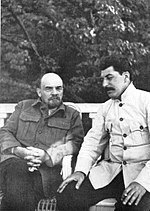 Stalin suppressed political opposition to him, committed the state ideology to Marxism–Leninism (which he created) and initiated a centrally planned economy. As a result, the country underwent a period of rapid industrialization and collectivization which laid the foundation for its victory in World War II and post-war dominance. Stalin also fomented political paranoia, and conducted the Great Purge to remove opponents of his from the Communist Party through the mass arbitrary arrest of many people (military leaders, Communist Party members, and ordinary citizens alike) who were then sent to correctional labour camps or sentenced to death. In the beginning of World War II, Stalin signed a non-aggression pact with Hitler's Germany; the treaty delayed confrontation between the two countries. In June 1941 the Germans invaded, opening the largest and bloodiest theatre of war in history. Soviet war casualties accounted for the highest proportion of the conflict in the cost of acquiring the upper hand over Axis forces at intense battles such as Stalingrad. Soviet forces eventually captured Berlin in 1945. The territory overtaken by the Red Army became satellite states of the Eastern Bloc. The Cold War emerged in 1947 as the Soviet bloc formed the Warsaw Pact and confronted the Western states that united in the North Atlantic Treaty Organization in 1949. However the USSR did not itself engage in any so-called "hot wars." Following Stalin's death in 1953, a period of political and economic liberalization, known as "de-Stalinization" and "Khrushchev's Thaw", occurred under the leadership of Nikita Khrushchev. The country grew rapidly, as millions of peasants were moved into industrialized cities. The Space Race heated up, and the USSR took an early lead with the first ever satellite and world's first human spaceflight. In the 1970s, there was, briefly, a détente of relations with the United States, but tensions resumed when the Soviet Union deployed troops in Afghanistan in 1979. The war drained economic resources and was matched by an escalation of American military aid to Mujahideen fighters. In the mid-1980s, the last Soviet leader, Mikhail Gorbachev, sought to further reform and liberalize the economy through his policies of glasnost and perestroika. The goal was to preserve the Communist Party while reversing economic stagnation. The Cold War ended during his tenure, and in 1989 Soviet satellite countries in Eastern Europe overthrew their respective communist regimes. This led to the rise of strong nationalist and separatist movements inside the USSR as well. Central authorities initiated a referendum—boycotted by the Baltic republics, Armenia, Georgia, and Moldova—which resulted in the majority of participating citizens voting in favor of preserving the Union as a renewed federation. In August 1991, a coup d'état was attempted by Communist Party hardliners. It failed, with Russian President Boris Yeltsin playing a high-profile role in facing down the coup, resulting in the banning of the Communist Party. On 25 December 1991, Gorbachev resigned and the remaining twelve constituent republics emerged from the dissolution of the Soviet Union as independent post-Soviet states. The Russian Federation (formerly the Russian SFSR) assumed the Soviet Union's rights and obligations and is recognized as its continued legal personality. 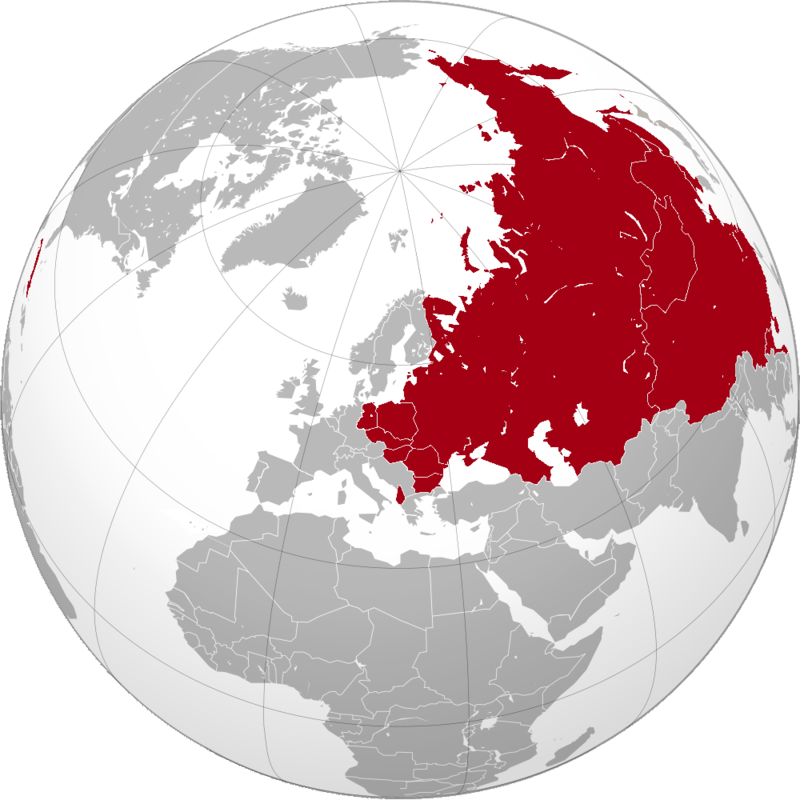 With an area of 22,402,200 square kilometres (8,649,500 sq mi), the Soviet Union was the world's largest country, a status that is retained by the Russian Federation. Covering a sixth of Earth's land surface, its size was comparable to that of North America. The European portion accounted for a quarter of the country's area, and was the cultural and economic centre. The eastern part in Asia extended to the Pacific Ocean to the east and Afghanistan to the south, and, except some areas in Central Asia, was much less populous. It spanned over 10,000 kilometres (6,200 mi) east to west across 11 time zones, and over 7,200 kilometres (4,500 mi) north to south. It had five climate zones: tundra, taiga, steppes, desert, and mountains. The Soviet Union had the world's longest border, like Russia, measuring over 60,000 kilometres (37,000 mi), or 1 1/2 circumferences of Earth. Two-thirds of it were a coastline. Across the Bering Strait was the United States. The Soviet Union bordered Afghanistan, China, Czechoslovakia, Finland, Hungary, Iran, Mongolia, North Korea, Norway, Poland, Romania, and Turkey from 1945 to 1991. The Soviet Union's highest mountain was Communism Peak (now Ismoil Somoni Peak) in Tajikistan, at 7,495 metres (24,590 ft). The Soviet Union also included most of the world's largest lake, the Caspian Sea (shared with Iran), and also Lake Baikal, the world's largest freshwater and deepest lake, an internal body of water in Russia. Modern revolutionary activity in the Russian Empire began with the Decembrist revolt of 1825. Although serfdom was abolished in 1861, it was done on terms unfavourable to the peasants and served to encourage revolutionaries. A parliament—the State Duma—was established in 1906 after the Russian Revolution of 1905, but Tsar Nicholas II resisted attempts to move from to constitutional monarchy. Social unrest continued and was aggravated during World War I by military defeat and food shortages in major Soviet cities. At the same time, workers' councils, known in Russian as "Soviets", sprang up across the country. The Bolsheviks, led by Vladimir Lenin, pushed for socialist revolution in the Soviets and on the streets. On 7 November 1917, the Red Guards stormed the Winter Palace in Petrograd, ending the rule of the Provisional Government and leaving all political power to the Soviets. This event would later be known as the Great October Socialist Revolution. In December, the Bolsheviks signed an armistice with the Central Powers, though by February 1918, fighting had resumed. In March, the Soviets ended involvement in the war for good and signed the Treaty of Brest-Litovsk. The Russian SFSR as a part of the USSR in 1922. The Russian SFSR as a part of the USSR after 1936 Russian territorial changes. An intensive restructuring of the economy, industry and politics of the country began in the early days of Soviet power in 1917. A large part of this was done according to the Bolshevik Initial Decrees, government documents signed by Vladimir Lenin. One of the most prominent breakthroughs was the GOELRO plan, which envisioned a major restructuring of the Soviet economy based on total electrification of the country. The plan was developed in 1920 and covered a 10 to 15-year period. It included construction of a network of 30 regional power stations, including ten large hydroelectric power plants, and numerous electric-powered large industrial enterprises. The plan became the prototype for subsequent Five-Year Plans and was fulfilled by 1931. Famines ensued, causing millions of deaths; surviving kulaks were persecuted and many sent to Gulags to do forced labour. Social upheaval continued in the mid-1930s. Stalin's Great Purge resulted in the execution or detainment of many "Old Bolsheviks" who had participated in the October Revolution with Lenin. According to declassified Soviet archives, in 1937 and 1938, the NKVD arrested more than one and a half million people, of whom 681,692 were shot. Over those two years that averages to over one thousand executions a day. According to historian Geoffrey Hosking, "...excess deaths during the 1930s as a whole were in the range of 10–11 million." Yet despite the turmoil of the mid-to-late 1930s, the Soviet Union developed a powerful industrial economy in the years before World War II. The early 1930s saw closer cooperation between the West and the USSR. From 1932 to 1934, the Soviet Union participated in the World Disarmament Conference. In 1933, diplomatic relations between the United States and the USSR were established when in November, the newly elected President of the United States, Franklin D. Roosevelt chose to formally recognize Stalin's Communist government and negotiated a new trade agreement between the two nations. In September 1934, the Soviet Union joined the League of Nations. After the Spanish Civil War broke out in 1936, the USSR actively supported the Republican forces against the Nationalists, who were supported by Fascist Italy and Nazi Germany. In the east, the Soviet military won several decisive victories during border clashes with the Empire of Japan in 1938 and 1939. However, in April 1941, USSR signed the Soviet–Japanese Neutrality Pact with the Empire of Japan, recognizing the territorial integrity of Manchukuo, a Japanese puppet state. The Soviet Union suffered greatly in the war, losing around 27 million people. Despite this, it emerged as a superpower in the post-war period. Once denied diplomatic recognition by the Western world, the Soviet Union had official relations with practically every nation by the late 1940s. A member of the United Nations at its foundation in 1945, the Soviet Union became one of the five permanent members of the United Nations Security Council, which gave it the right to veto any of its resolutions. During the immediate postwar period, the Soviet Union rebuilt and expanded its economy, while maintaining its strictly centralized control. It aided post-war reconstruction in the countries of Eastern Europe, while turning them into satellite states, binding them in a military alliance (the Warsaw Pact) in 1955, and an economic organization (The Council for Mutual Economic Assistance or Comecon) from 1949 to 1991, the latter a counterpart to the European Economic Community. Later, the Comecon supplied aid to the eventually victorious Communist Party of China, and saw its influence grow elsewhere in the world. Fearing its ambitions, the Soviet Union's wartime allies, the United Kingdom and the United States, became its enemies. In the ensuing Cold War, the two sides clashed indirectly using mostly proxies. The Soviet Union and other countries in the world, under a government modeled after the Soviet Union's, after the Cuban Revolution of 1959 and before the official Sino-Soviet split of 1961. In the late 1950s, a confrontation with China regarding the USSR's rapprochement with the West and what Mao Zedong perceived as Khrushchev's revisionism led to the Sino–Soviet split. This resulted in a break throughout the global Marxist–Leninist movement, with the governments in Albania, Cambodia and Somalia choosing to ally with China in place of the USSR. During this period of the late 1950s and early 1960s, the Soviet Union continued to realize scientific and technological exploits in the Space Race, rivaling the United States: launching the first artificial satellite, Sputnik 1 in 1957; a living dog named Laika in 1957; the first human being, Yuri Gagarin in 1961; the first woman in space, Valentina Tereshkova in 1963; Alexey Leonov, the first person to walk in space in 1965; the first soft landing on the moon by spacecraft Luna 9 in 1966 and the first moon rovers, Lunokhod 1 and Lunokhod 2. Soviet General Secretary Leonid Brezhnev and US President Jimmy Carter sign the SALT II arms limitation treaty in Vienna on 18 June 1979. Gorbachev also moved to end the Cold War. 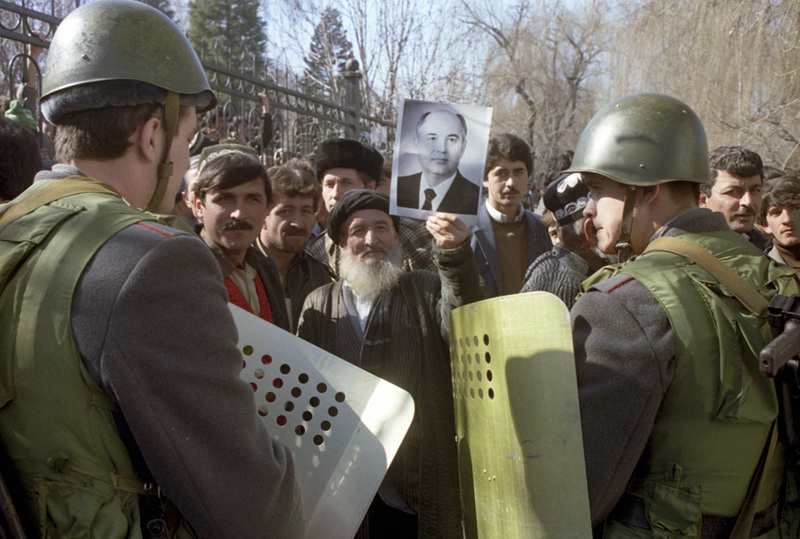 In 1988, the Soviet Union abandoned its nine-year war in Afghanistan and began to withdraw its forces. In the late 1980s,[Clarification needed], which paved the way for Revolutions of 1989. With the tearing down of the Berlin Wall and with East Germany and West Germany pursuing unification, the Iron Curtain came down. 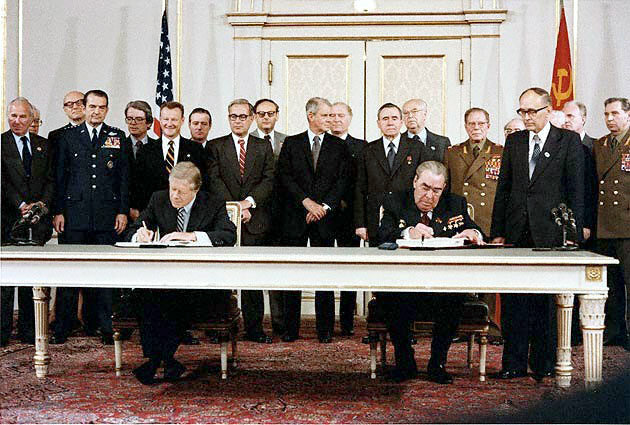 The signing of the treaty, however, was interrupted by the August Coup—an attempted coup d'état by hardline members of the government and the KGB who sought to reverse Gorbachev's reforms and reassert the central government's control over the republics. After the coup collapsed, Yeltsin was seen as a hero for his decisive actions, while Gorbachev's power was effectively ended. The balance of power tipped significantly towards the republics. In August 1991, Latvia and Estonia immediately declared the restoration of their full independence (following Lithuania's 1990 example). Gorbachev resigned as general secretary in late August, and soon afterward the Party's activities were indefinitely suspended—effectively ending its rule. By the fall, Gorbachev could no longer influence events outside of Moscow, and he was being challenged even there by Yeltsin, who had been elected President of Russia in July 1991. The remaining 12 republics continued discussing new, increasingly looser, models of the Union. However, by December, all except Russia and Kazakhstan had formally declared independence. During this time, Yeltsin took over what remained of the Soviet government, including the Moscow Kremlin. The final blow was struck on 1 December, when Ukraine, the second most powerful republic, voted overwhelmingly for independence. Ukraine's secession ended any realistic chance of the Soviet Union staying together even on a limited scale. 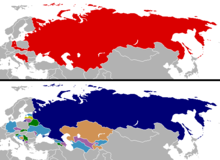 Constitutionally, the USSR was a federation of constituent Union Republics, which were either unitary states, such as Ukraine or Belarus (SSRs), or federal states, such as Russia or Transcaucasia (SFSRs), all four being the founding republics who signed the Treaty on the Creation of the USSR in December 1922. In 1924, during the national delimitation in Central Asia, the Uzbek and Turkmen SSRs were formed from parts of the Russia's Turkestan ASSR and two Soviet dependencies, the Khorezm and Bukharan SSRs. In 1929, the Tajik SSR was split off from the Uzbek SSR. With the constitution of 1936, the Transcaucasian SFSR was dissolved, resulting in its constituent Armenian, Georgian and Azerbaijan SSRs being elevated to Union Republics, while the Kazakh and Kirghiz SSRs were split off from Russian SFSR, resulting in the same status. In August 1940, the Moldavian SSR was formed from parts of the Ukrainian SSR and Bessarabia and Northern Bukovina. The Estonian, Latvian and Lithuanian SSRs were also admitted into the union. The Karelo-Finnish SSR was split off from Russia as a Union Republic in March 1940 and was reabsorbed in 1956. 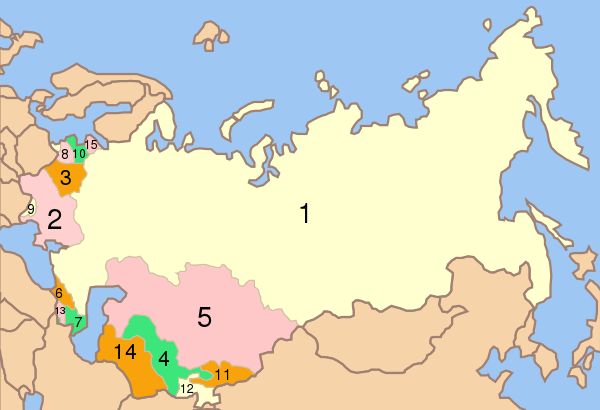 Between July 1956 and September 1991, there were 15 union republics (see map below). The Soviet Union became the first country to adopt a planned economy, whereby production and distribution of goods were centralized and directed by the government. The first Bolshevik experience with a command economy was the policy of War communism, which involved the nationalization of industry, centralized distribution of output, coercive requisition of agricultural production, and attempts to eliminate the circulation of money, as well as private enterprises and free trade. After the severe economic collapse caused by the war, Lenin replaced War Communism with the New Economic Policy (NEP) in 1921, legalising free trade and private ownership of smaller businesses. The economy quickly recovered. From the 1930s until its collapse in late 1991, the way the Soviet economy operated remained essentially unchanged. 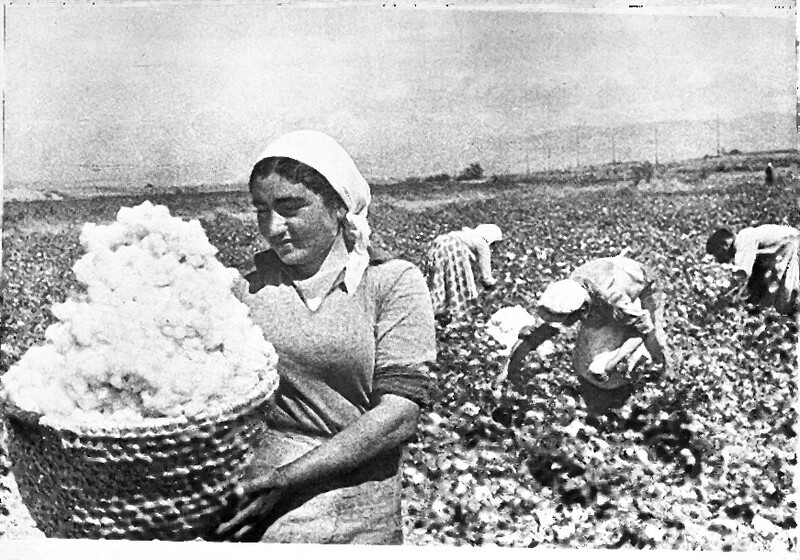 The economy was formally directed by central planning, carried out by Gosplan and organized in five-year plans. In practice, however, the plans were highly aggregated and provisional, subject to ad hoc intervention by superiors. All key economic decisions were taken by the political leadership. Allocated resources and plan targets were normally denominated in rubles rather than in physical goods. Credit was discouraged, but widespread. Final allocation of output was achieved through relatively decentralized, unplanned contracting. Although in theory prices were legally set from above, in practice the actual prices were often negotiated, and informal horizontal links (between producer factories etc.) were widespread. In 1987, Mikhail Gorbachev tried to reform and revitalize the economy with his program of perestroika. His policies relaxed state control over enterprises, but did not yet allow it to be replaced by market incentives, ultimately resulting in a sharp decline in production output. The economy, already suffering from reduced petroleum export revenues, started to collapse. Prices were still fixed, and property was still largely state-owned until after the dissolution of the Soviet Union. For most of the period after World War II up to its collapse, the Soviet economy was the second largest in the world by GDP (PPP), and was 3rd in the world during the middle of the 1980s to 1989, though in per capita terms the Soviet GDP was behind that of the First World countries. The Soviet Union placed great emphasis on science and technology within its economy, however, the most remarkable Soviet successes in technology, such as producing the world's first space satellite, typically were the responsibility of the military. Lenin believed that the USSR would never overtake the developed world if it remained as technologically backward as it was upon its founding. Soviet authorities proved their commitment to Lenin's belief by developing massive networks, research and development organizations. In the early 1960s, the Soviets awarded 40% of chemistry PhD's to women, compared to only 5% who received such a degree in the United States. By 1989, Soviet scientists were among the world's best-trained specialists in several areas, such as energy physics, selected areas of medicine, mathematics, welding and military technologies. Due to rigid state planning and bureaucracy, the Soviets remained far behind technologically in chemistry, biology, and computers when compared to the First World. Anatoly Lunacharsky became the first People's Commissar for Education of Soviet Russia. At the beginning, the Soviet authorities placed great emphasis on the elimination of illiteracy. People who were literate were automatically hired as teachers. For a short period, quality was sacrificed for quantity. By 1940, Joseph Stalin could announce that illiteracy had been eliminated. Throughout the 1930s social mobility rose sharply, which has been attributed to Soviet reforms in education. In the aftermath of the Great Patriotic War, the country's educational system expanded dramatically. This expansion had a tremendous effect. In the 1960s, nearly all Soviet children had access to education, the only exception being those living in remote areas. 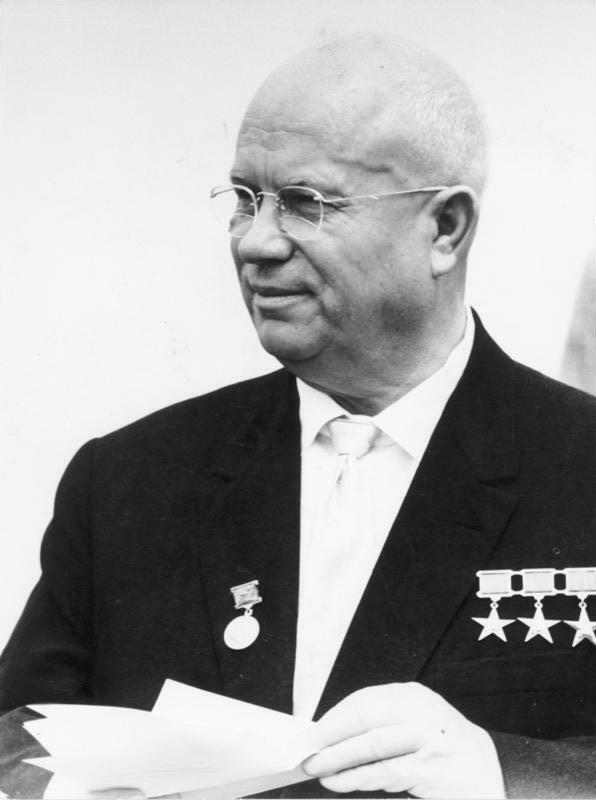 Nikita Khrushchev tried to make education more accessible, making it clear to children that education was closely linked to the needs of society. Education also became important in giving rise to the New Man. The country's system of education was highly centralized and universally accessible to all citizens, with affirmative action for applicants from nations associated with cultural backwardness. Citizens directly entering the work force had the constitutional right to a job and to free vocational training. The Brezhnev era introduced a rule that required all university applicants to present a reference from the local Komsomol party secretary. According to statistics from 1986, the number of higher education students per the population of 10,000 was 181 for the USSR, compared to 517 for the U.S.
All citizens of the USSR had their own ethnic affiliation. The ethnicity of a person was chosen at the age of sixteen by the child's parents. If the parents did not agree, the child was automatically assigned the ethnicity of the father. Partly due to Soviet policies, some of the smaller minority ethnic groups were considered part of larger ones, such as the Mingrelians of Georgia, who were classified with the linguistically related Georgians. Some ethnic groups voluntarily assimilated, while others were brought in by force. Russians, Belarusians, and Ukrainians shared close cultural ties, while other groups did not. With multiple nationalities living in the same territory, ethnic antagonisms developed over the years. The religious made up a significant minority of the Soviet Union prior to break up. In 1990, the religious makeup was 20% Russian Orthodox, 10% Muslim, 7% Protestant, Armenian Apostolic, Georgian Orthodox, and Roman Catholic, less than 1% Jewish and 60% atheist. Christianity and Islam had the greatest number of adherents among the Soviet state's religious citizens. Eastern Christianity predominated among Christians, with Russia's traditional Russian Orthodox Church being the Soviet Union's largest Christian denomination. About 90 percent of the Soviet Union's Muslims were Sunnis, with Shias concentrated in Azerbaijan. Smaller groups included Roman Catholics, Jews, Buddhists, and a variety of Protestant sects. Convinced that religious anti-Sovietism had become a thing of the past with most Soviet Christians, and with the looming threat of war, the Stalin regime began shifting to a more moderate religion policy in the late 1930s. Soviet religious establishments overwhelmingly rallied to support the war effort during the Soviet war with Nazi Germany. 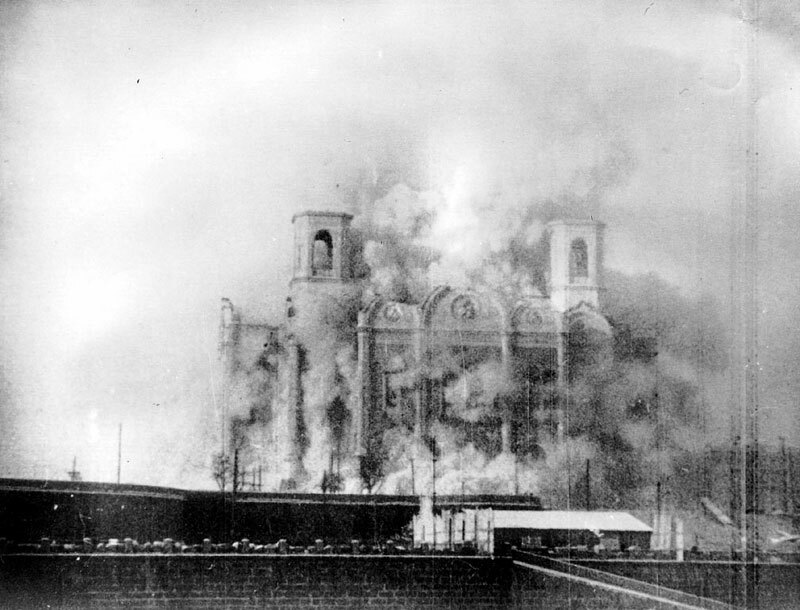 Amid other accommodations to religious faith after Hitler attacked the Soviet Union, churches were reopened, Radio Moscow began broadcasting a religious hour, and a historic meeting between Stalin and Orthodox Church leader Patriarch Sergius of Moscow was held in 1943. Stalin had the support of the majority of the religious people in the Soviet Union even through the late 1980s. The general tendency of this period was an increase in religious activity among believers of all faiths. Soviet efforts to expand social, political and economic opportunities for women constitute "the earliest and perhaps most far-reaching attempt ever undertaken to transform the status and role of women." In 2014, on the initiative of the citizen of the city of Tolyatti Dmitry Tretyakov, born in 1981, took judicial attempts to challenge the alleged unconstitutional dissolution of the Soviet Union in court. In his claim to the government of Russia, the applicant referred to the legislation of the Soviet Union, Law of the USSR No. 1409-I dated 3 April 1990 "On the order of issues related to the secession of Union republics from the USSR". On 29 May, the Constitutional Court of Russia, with 18 judges, chaired by Valery Zorkin, dismissed the complaint in a final unappealable decision. On 27 November 2014, the European Court of Human Rights in Strasbourg, under the chairmanship of judge Elisabeth Steiner, decided to reject the complaint, additionally stating that the decision cannot be appealed to the Grand Chamber. ↑ Russia - Encyclopedia Britannica. Britannica.com (27 April 2010). Retrieved on 29 July 2013. ↑ "The causes of the October Revolution". BBC. http://www.bbc.co.uk/bitesize/higher/history/russia/october/revision/1/. Retrieved 5 August 2014. ↑ Evan Mawdsley (1 March 2007). The Russian Civil War. Pegasus Books. p. 287. ISBN 978-1-933648-15-6. https://books.google.com/?id=LUhXZD2BPeQC&pg=PA287. ↑ (Russian) Creation of the USSR at Khronos.ru. ↑ Lapin, G. G. (2000). "70 Years of Gidroproekt and Hydroelectric Power in Russia". pp. 374–379. Digital object identifier:10.1023/A:1004107617449. ↑ Lenin, V.I.. Collected Works. pp. 152–164, Vol. 31. ""The proletarian state must effect the transition to collective farming with extreme caution and only very gradually, by the force of example, without any coercion of the middle peasant."" ↑ Stéphane Courtois; Mark Kramer (15 October 1999). Livre noir du Communisme: crimes, terreur, répression. Harvard University Press. p. 206. ISBN 978-0-674-07608-2. https://books.google.com/?id=H1jsgYCoRioC&pg=PA206. ↑ Abbott Gleason (2009). A companion to Russian history. Wiley-Blackwell. p. 373. ISBN 978-1-4051-3560-3. https://books.google.com/?id=JyN0hlKcfTcC&pg=PA373. ↑ 15.0 15.1 Geoffrey A. Hosking (2001). Russia and the Russians: a history. Harvard University Press. p. 469. ISBN 978-0-674-00473-3. https://books.google.com/?id=oh-5AAmboMUC&pg=PA469. ↑ Ukrainian 'Holodomor' (man-made famine) Facts and History. Holodomorct.org (28 November 2006). Retrieved on 29 July 2013. 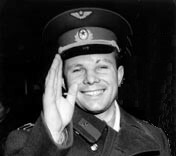 ↑ (Russian) Mel'tiukhov, Mikhail. Upushchennyi shans Stalina: Sovietskii Soiuz i bor'ba za Evropu 1939–1941. Moscow: Veche, 2000. ISBN 5-7838-1196-3. ↑ William J. Duiker (31 August 2009). Contemporary World History. Wadsworth Pub Co. p. 128. ISBN 978-0-495-57271-8. https://books.google.com/?id=uqvgYtJHGSMC. ↑ 21.0 21.1 Geoffrey A. Hosking (2006). Rulers and victims: the Russians in the Soviet Union. Harvard University Press. p. 242. ISBN 978-0-674-02178-5. https://books.google.com/?id=CDMVMqDvp4QC&pg=PA242. ↑ "Main Intelligence Administration (GRU) Glavnoye Razvedovatel'noye Upravlenie – Russia / Soviet Intelligence Agencies". Fas.org. https://fas.org/irp/world/russia/gru/. Retrieved 24 November 2008. ↑ "Tank on the Moon". Archived from the original on 26 December 2008. https://web.archive.org/20081226123643/http://www.cbc.ca:80/natureofthings/magazine2.html. ↑ 28.0 28.1 28.2 Buhler, Konrad G. (2001). State Succession and Membership in International Organizations. Legal Aspects of International Organization Series. Volume 38. Martinus Nijhoff Publishers. p. 164. ISBN 9789041115539. https://books.google.com/books?id=Ty7NAG1Jl-8C&pg=PA164. ↑ Talari, Pekka T. (1996). State Succession in Respect of Debts: The Effect of State Succession in the 1990's on the Rules of Law. The Finnish Yearbook of International Law. 2. Martinus Nijhoff Publishers. p. 167. ISBN 9789041104694. https://books.google.com/books?id=9nKKnb8uiHsC&pg=PA167. ↑ 30.0 30.1 Sakwa, Richard. Soviet Politics in Perspective. 2nd ed. London – N.Y.: Routledge, 1998. ↑ Law, David A. (1975). Russian Civilization. Ardent Media. pp. 193–94. ISBN 978-0-8422-0529-0. https://books.google.com/books?id=f3ky9qBavl4C&dq. ↑ Zemtsov, Ilya (1989). Chernenko: The Last Bolshevik: The Soviet Union on the Eve of Perestroika. Transaction Publishers. p. 325. ISBN 978-0-88738-260-4. https://books.google.com/books?id=hgscfLr5dCsC&dq. ↑ Knight, Amy (1995). Beria: Stalin's First Lieutenant. Princeton University Press. p. 5. ISBN 0-691-01093-5. https://books.google.com/books?id=PxiuUGRQhUIC&dq. ↑ Hough, Jerry F.; Fainsod, Merle (1979). How the Soviet Union is Governed. Harvard University Press. p. 486. ISBN 0-674-41030-0. https://books.google.com/books?id=38gMzMRXCpQC&dq. ↑ Service, Robert (2009). History of Modern Russia: From Tsarism to the Twenty-first Century. Penguin Books Ltd. p. 378. ISBN 0-14-103797-0. https://books.google.com/books?id=o8Z1QAAACAAJ&dq. ↑ Конститутион оф тхе Руссиян Федератион: витх комментариес анд интерпретатион. Brunswick Publishing Corp. 1994. p. 82. ISBN 1-55618-142-6. https://books.google.com/books?id=3mQjvzP8VSYC&dq. ↑ Ōgushi, Atsushi (2008). The Demise of the Soviet Communist Party. Routledge. pp. 31–32. ISBN 0-415-43439-4. https://books.google.com/books?id=N7mDUC1nOZsC&dq. ↑ Taras, Ray (1989). Leadership change in Communist states. Routledge. p. 132. ISBN 0-04-445277-2. https://books.google.com/books?id=AlcVAAAAIAAJ&dq. ↑ F. Triska, Jan; Slusser, Robert M. (1962). The Theory, Law, and Policy of Soviet Treaties. Stanford University Press. pp. 63–64. ISBN 0-8047-0122-9. https://books.google.com/books?id=QmWmAAAAIAAJ&dq. ↑ Deb, Kalipada (1996). Soviet Union to Commonwealth: Transformation and Challenges. M.D. Publications Pvt. Ltd. p. 81. ISBN 81-85880-95-6. https://books.google.com/books?id=IvK6r-8Ogg0C&dq. ↑ 41.0 41.1 Benson, Shirley (2001). Nikita Khrushchev and the Creation of a Superpower. Penn State University Press. pp. XIV. ISBN 0-271-02170-5. https://books.google.com/books?id=dQeahlZdM7sC&dq. ↑ The Communist World. Ardent Media. 2001. p. 441. ISBN 0-271-02170-5. https://books.google.com/books?id=h9FFVgu-Ff0C&dq. ↑ Joseph Marie Feldbrugge, Ferdinand (1993). Russian Law: The End of the Soviet System and the Role of Law. Martinus Nijhoff Publishers. p. 205. ISBN 0-7923-2358-0. https://books.google.com/books?id=JWt7MN3Dch8C&dq. ↑ White, Stephen; J. Gill, Graeme; Slider, Darrell (1993). The Politics of Transition: Shaping a post-Soviet Future. Cambridge University Press. p. 108. ISBN 978-0-521-44634-1. https://books.google.com/books?id=O9IGbITqT_EC&dq. ↑ P. Hoffmann, Erik; Laird, Robin Frederick (1984). The Soviet Polity in the Modern Era. Transaction Publishers. pp. 313–315. ISBN 0-202-24165-3. https://books.google.com/books?id=63_obglArrMC&dq. ↑ P. Hoffmann, Erik; Laird, Robin Frederick (1984). The Soviet Polity in the Modern Era. Transaction Publishers. pp. 315–319. ISBN 0-202-24165-3. https://books.google.com/books?id=63_obglArrMC&dq. ↑ "The Soviet Polity in the Modern Era". Great Russian Encyclopedia. Bol'shaya Rossiyskaya Enciklopediya Publisher. 2005. p. 742. ↑ Sakwa, Richard (1998). Soviet Politics in Perspective. Routledge. p. 106. ISBN 0-415-07153-4. https://books.google.com/books?id=vX1U5G_xnqcC&dq. ↑ Kucherov, Samuel (1970). The Organs of Soviet Administration of Justice: Their History and Operation. Brill Archive Publishers. p. 31. https://books.google.com/books?id=ssMUAAAAIAAJ&dq. ↑ Phillips, Steve (2000). Lenin and the Russian Revolution. Heinemann. p. 71. ISBN 978-0-435-32719-4. https://books.google.com/books?id=_na0zfdhKQMC&dq. ↑ Union of Soviet Socialist Republics. Encyclopædia Britannica, Inc.. 2005. p. 1014. ↑ Service, Robert (2009). History of Modern Russia: From Tsarism to the Twenty-first Century. Penguin Books Ltd. p. 379. ISBN 0-14-103797-0. https://books.google.com/books?id=o8Z1QAAACAAJ&dq. ↑ 53.0 53.1 Khrushchev, Nikita (2007). Memoirs of Nikita Khrushchev, Volume 3: Statesman. Pennsylvania State University Press. p. 674. ISBN 978-0-271-02935-1. ↑ Polley, Martin (2000). A–Z of modern Europe since 1789. Routledge. p. 88. ISBN 0-415-18597-1. https://books.google.com/books?id=_f8Avd5N5Y4C&dq. ↑ "Gorbachev's Reform Dilemma". Library of Congress Country Studies. http://countrystudies.us/russia/18.htm. Retrieved 16 October 2010. ↑ Polmar, Norman (1991). The Naval Institute Guide to the Soviet. United States Naval Institute. p. 1. ISBN 0-87021-241-9. https://books.google.com/books?id=tkGDkpkQh-sC&dq. ↑ McCauley, Martin (2007). The Rise and Fall of the Soviet Union. Pearson Education. p. 490. ISBN 0-582-78465-4. https://books.google.com/books?id=ycCZqmhhceMC&dq. ↑ Government of the USSR: Gorbachev, Mikhail (21 March 1972) (in Russian). Law: About state governing bodies of USSR in a transition period On the bodies of state authority and administration of the USSR in Transition. sssr.su. http://www.sssr.su/zopp.html. Retrieved 15 October 1991. ↑ Vincent Daniels, Robert (1993). A Documentary History of Communism in Russia: From Lenin to Gorbachev. University Press of New England (UPNE). p. 388. ISBN 0-87451-616-1. https://books.google.com/books?id=gTIZ2dvDKF0C&dq. ↑ Encyclopædia Britannica. "Inquisitorial procedure (law) – Britannica Online Encyclopedia". Encyclopædia Britannica, Inc.. http://www.britannica.com/EBchecked/topic/288956/inquisitorial-procedure. Retrieved 30 October 2010. ↑ Adams, Simon (2005). Russian Republics. Black Rabbit Books. p. 21. ISBN 978-1-58340-606-9. https://books.google.com/books?id=LyqIDCc-cSsC&dq. ↑ Feldbrugge, Ferdinand Joseph Maria (1993). Russian Law: The Rnd of the Soviet system and the Role of Law. Martinus Nijhoff Publishers. p. 94. ISBN 0-7923-2358-0. https://books.google.com/books?id=JWt7MN3Dch8C&dq. ↑ 63.0 63.1 63.2 63.3 63.4 63.5 Gregory, Paul R. (2004). The Political Economy of Stalinism: Evidence from the Soviet Secret Archives. Cambridge University Press. pp. 218–20. ISBN 0-521-53367-8. https://books.google.com/books?id=hFHU5kaXhu8C&dq. ↑ Mawdsley, Evan (1998). The Stalin Years: The Soviet Union, 1929–1953. Manchester University Press. p. 30. ISBN 0-7190-4600-9. https://books.google.com/?id=m-voAAAAIAAJ&dq. ↑ Wheatcroft, S. G.; Davies, R. W.; Cooper, J. M. (1986). Soviet Industrialization Reconsidered: Some Preliminary Conclusions about Economic Development between 1926 and 1941. 39. Economic History Review. pp. 30–2. ISBN 978-0-7190-4600-1. https://books.google.com/?id=m-voAAAAIAAJ&dq. ↑ "Reconstruction and Cold War". Library of Congress. http://countrystudies.us/russia/12.htm. Retrieved 23 October 2010. ↑ 67.0 67.1 67.2 67.3 "Reconstruction and Cold War". Library of Congress Country Studies. http://rs6.loc.gov/cgi-bin/query/r?frd/cstdy:@field%28DOCID+su0391%29. Retrieved 23 October 2010. ↑ IMF and OECD (1991). A Study of the Soviet Economy. 1. International Monetary Fund. p. 9. ISBN 0-14-103797-0. https://books.google.com/?id=o8Z1QAAACAAJ&dq. ↑ 69.0 69.1 "Economy". Library of Congress Country Studies. http://rs6.loc.gov/cgi-bin/query/r?frd/cstdy:@field%28DOCID+su0009%29. Retrieved 23 October 2010. ↑ 70.0 70.1 Hanson, Philip. The Rise and Fall of the Soviet Economy: An Economic History of the USSR from 1945. London: Longman, 2003. ↑ Bergson, Abram (1997). "How Big was the Soviet GDP?". pp. 1–14. Digital object identifier:10.1057/ces.1997.1. ↑ Harrison, Mark (1993). "Soviet Economic Growth Since 1928: The Alternative Statistics of G. I. Khanin". pp. 141–167. Digital object identifier:10.1080/09668139308412080. ↑ Gvosdev, Nikolas (2008). The Strange Death of Soviet communism: A Postscript. Transaction Publishers. ISBN 1-4128-0698-4. https://books.google.com/?id=Q_xTyZUEqkYC&dq. ↑ Fischer, Stanley; Easterly, William (1994). "The Soviet Economic Decline, Historical and Republican Data" (PDF). World Bank. http://www-wds.worldbank.org/external/default/WDSContentServer/IW3P/IB/1994/04/01/000009265_3961006063138/Rendered/PDF/multi0page.pdf. Retrieved 23 October 2010. ↑ Rosefielde, Steven (1996). "Stalinism in Post-Communist Perspective: New Evidence on Killings, Forced Labour and Economic Growth in the 1930s". Taylor & Francis, Ltd.. pp. 956–987. JSTOR 152635. "The new evidence shows that administrative command planning and Stalin's forced industrialization strategies failed in the 1930s and beyond. The economic miracle chronicled in official hagiographies and until recently faithfully recounted in Western textbooks has no basis in fact. It is the statistical artefact not of index number relativity (the Gerschenkron effect) but of misapplying to the calculation of growth cost prices that do not accurately measure competitive value. The standard of living declined during the 1930s in response to Stalin's despotism, and after a brief improvement following his death, lapsed into stagnation. Glasnost and post-communist revelations interpreted as a whole thus provide no basis for Getty, Rittersporn & Zemskov's relatively favourable characterization of the methods, economic achievements and human costs of Stalinism. The evidence demonstrates that the suppression of markets and the oppression of vast segments of the population were economically counterproductive and humanly calamitous, just as anyone conversant with classical economic theory should have expected." ↑ Central Intelligence Agency (1991). "GDP – Million 1990". The World Factbook. http://www.theodora.com/wfb/1990/rankings/gdp_million_1.html. Retrieved 12 June 2010. ↑ Central Intelligence Agency (1992). "GDP Per Capita – 1991". The World Factbook. http://www.theodora.com/wfb/1991/rankings/gdp_per_capita_0.html. Retrieved 12 June 2010. ↑ Wilson, David (1983). The Demand for Energy in the Soviet Union. Rowman and Littfield. pp. 105 to 108. ISBN 9780709927044. ↑ 83.0 83.1 83.2 Central Intelligence Agency (1991). "Soviet Union – Communications". The World Factbook. http://www.theodora.com/wfb1991/soviet_union/soviet_union_communications.html. Retrieved 20 October 2010. ↑ Central Intelligence Agency (1992). "Soviet Union – Economy". The World Factbook. http://www.theodora.com/wfb1991/soviet_union/soviet_union_economy.html. Retrieved 23 October 2010. ↑ Hardt, John Pearce; Hardt, John P. (2003). Russia's Uncertain Economic Future: With a Comprehensive Subject Index. M.E. Sharpe. p. 233. ISBN 0-7656-1208-9. https://books.google.com/books?id=IvKF3PKGYAcC&dq. ↑ "Science and Technology". Library of Congress Country Studies. http://rs6.loc.gov/cgi-bin/query/r?frd/cstdy:@field%28DOCID+su0413%29. Retrieved 23 October 2010. ↑ MacFarland, Margo (3 May 1990). "Global Tech Strategies Brought to U.S". ↑ Highman, Robert D.S. ; Greenwood, John T.; Hardesty, Von (1998). Russian Aviation and Air Power in the Twentieth Century. Routledge. p. 134. ISBN 978-0-7146-4784-5. http://books.google.no/books?id=cpynoFM-Jf4C&dq. ↑ 92.0 92.1 Wilson 1983, p. 205. ↑ 97.0 97.1 Ambler, Shaw and Symons 1985, p. 167. ↑ Mark Harrison (18 July 2002). Accounting for War: Soviet Production, Employment, and the Defence Burden, 1940–1945. Cambridge University Press. p. 167. ISBN 978-0-521-89424-1. https://books.google.com/?id=yJcD7_Q_rQ8C&pg=PA167. ↑ Jay Winter, Emmanuel Sivan (2000). War and Remembrance in the Twentieth Century. Cambridge University Press. p. 64. ISBN 0521794366. https://books.google.com/books?id=ZK2A5x7E8IkC&pg=PA64. ↑ Government of the USSR (1977) (in Russian). [Great Soviet Encyclopaedia]. 24. Moscow: State Committee for Publishing. p. 15. ↑ Ryan, Michael (28 May 1988). Life Expectancy and Mortality Data from the Soviet Union. 296. p. 1,513–1515. ↑ Law, David A. (1975). Russian Civilization. Ardent Media. pp. 300–1. ISBN 0-8422-0529-2. https://books.google.com/books?id=f3ky9qBavl4C&dq. ↑ Shlapentokh, Vladimir (1990). Soviet Intellectuals and Political Power: The Post-Stalin Era. I.B. Tauris. p. 26. ISBN 978-1-85043-284-5. https://books.google.com/books?id=7VFqqE5995UC&dq. ↑ Pejovich, Svetozar (1990). The Economics of Property Rights: Towards a Theory of Comparative Systems. Springer Science+Business Media. p. 130. ISBN 978-0-7923-0878-2. https://books.google.com/?id=ocQKHRReKdcC. ↑ Central Intelligence Agency (1991). "Soviet Union – People". The World Factbook. http://www.theodora.com/wfb1991/soviet_union/soviet_union_people.html. Retrieved 25 October 2010. ↑ (in Russian) Law of the USSR from 24 April 1990 On languages of the USSR. Government of the Soviet Union. 24 April 1990. http://legal-ussr.narod.ru/data01/tex10935.htm. Retrieved 24 October 2010. ↑ 127.0 127.1 127.2 Eaton, Katherine Bliss (2004). Daily life in the Soviet Union. Greenwood Publishing Group. pp. 285 and 286. ISBN 0-313-31628-7. https://books.google.com/books?id=VVFuYN8TS5AC&dq. ↑ Silvio Ferrari; W. Cole Durham; Elizabeth A. Sewell (2003). Law and religion in post-communist Europe. Peeters Pub & Booksellers. p. 261. ISBN 978-90-429-1262-5. https://books.google.com/?id=QEucgny-0k4C. ↑ 129.0 129.1 129.2 129.3 Simon 1974, pp. 64–65. ↑ Atwood, Craig D. (2001). Always Reforming: A History of Christianity Since 1300. Macon, Georgia: Mercer University Press. p. 311. ISBN 0-86554-679-7. https://books.google.com/books?id=72Ulz0fpr4cC. ↑ 132.0 132.1 132.2 Janz 1998, pp. 38–39. ↑ Ro'i, Yaacov (1995). Jews and Jewish Life in Russia and the Soviet Union. London: Frank Cass. p. 263. ISBN 0-7146-4619-9. https://books.google.com/books?id=bJBH5pxzSyMC. ↑ 134.0 134.1 Nahaylo, Bohdan & Victor Swoboda (1990). Soviet Disunion: A History of the Nationalities Problem in the USSR. London: Hamish Hamilton. p. 144. ISBN 0-02-922401-2. https://books.google.com/books?id=ZrG7vrPue4wC. ↑ Mark D. Steinberg; Catherine Wanner (October 2008). Religion, morality, and community in post-Soviet societies. Indiana University Press. p. 6. ISBN 978-0-253-22038-7. https://books.google.com/?id=LR6X3EY8oPIC. ↑ McKay, George; Williams, Christopher (2009). Subcultures and New Religious Movements in Russia and East-Central Europe. Peter Lang. pp. 231–32. ISBN 3-03911-921-4. https://books.google.com/books?id=xpNBm-z7aOYC&dq. ↑ Warshofsky Lapidus 1978, p. 3. ↑ "Gorbachev, Mikhail." Encyclopædia Britannica. 2007. Encyclopædia Britannica Online. 2 October 2007 <http://www.britannica.com/eb/article-9037405>. "Under his new policy of glasnost ("openness"), a major cultural thaw took place: freedoms of expression and of information were significantly expanded; the press and broadcasting were allowed unprecedented candour in their reportage and criticism; and the country's legacy of Stalinist totalitarian rule was eventually completely repudiated by the government." Comrie, Bernard (1981). The Languages of the Soviet Union. Cambridge University Press (CUP) Archive. ISBN 978-0-521-29877-3. https://books.google.com/books?id=QTU7AAAAIAAJ&dq. Janz, Denis (1998). World Christianity and Marxism. New York: Oxford University Press. ISBN 978-0-19-511944-2. https://books.google.com/books?id=EUVwrcnXwBsC. Lane, David Stuart (1992). Soviet Society under Perestroika. Routledge. ISBN 978-0-415-07600-5. https://books.google.com/books?id=rcXafOqyxgQC&dq. Simon, Gerard (1974). Church, State, and Opposition in the U.S.S.R.. Berkeley and Los Angeles: University of California Press. ISBN 978-0-520-02612-4. https://books.google.com/books?id=sTLc8H3b4vUC. World Bank and OECD (1991). A Study of the Soviet economy. 3. International Monetary Fund. ISBN 9789264134683. https://books.google.com/books?id=fiDpE5M9jRAC&dq. Palat, Madhavan K. (2001). Social Identities in Revolutionary Russia. UK: Palgrave. ISBN 978-0-333-92947-6. https://books.google.com/books?id=T-d_QgAACAAJ. Retrieved 26 May 2012. Vallin, Jacques; Meslé, France; Adamets, Serguei; and Pyrozhkov, Serhii. "A New Estimate of Ukrainian Population Losses During the Crises of the 1930s and 1940s." Population Studies (2002) 56(3): 249-264. in JSTOR Reports life expectancy at birth fell to a level as low as ten years for females and seven for males in 1933 and plateaued around 25 for females and 15 for males in the period 1941–44. Rizzi, Bruno: The Bureaucratization of the World: The First English edition of the Underground Marxist Classic That Analyzed Class Exploitation in the USSR, New York, NY: Free Press, 1985. Majority in former Soviet states believe breakup was harmful mistake – poll. RT, 21 December 2013.